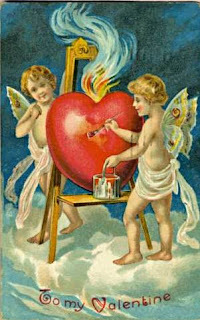 Valentines day!, a day to celebrate the ones we love, the years we have spent with them. Do we really need a day for this? I cherish my husband everyday! I'm thankful for the things he does, the things he says and the way he is. I don't need one special day to do this. However that been said, i did buy him a card, i did wish him a happy valentines day and we will enjoy a nice meal together to celebrate the 11 yrs we have been together and the nearly 9 we have been married! Pics that make me smile! 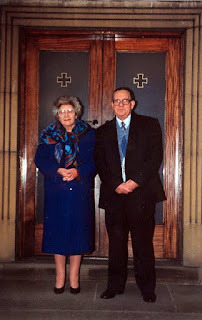 My grandparents on my fathers side, This was on their Golden Wedding anniversay, grandad would have been 100 now and grandma 96! My husband dancing away on the old work bar, such fun in those days. The only picture i have of me, my mom and my dad together! I have loads more that make me smile but these are my most fav today! Which makes you smile? Down the road, with a lack of information! This week has been a long week even if i do say so myself. Monday i was in hospital after having a Laparoscopy a Hysteroscopy and a dye. So feeling a little sore, bruised and down. This has come after so far 5 years of not been able to conceive. Umpteen tests, medication, seamen analysis, scans, poking, prodding, miss given information and plenty of circles been run around! When we initially went to see the fertility consultant he said nothing wrong and was just classed as secondary infertility, nothing more they can do all we can do is continue to try and go for ivf as that may be the best option. So that's what we decided to do .